After fighting the English on behalf of Scotland in Braveheart, Mel Gibson moves forward a few centuries and re-engages the same enemy. In The Patriot he battles on behalf of a free America in the War of Independence. The era may be different, but the story is the same: an initially reluctant man is drawn into the middle of a violent conflict to serve the cause of freedom, and helps to define the course of history. It's 1776, and the American Revolution is boiling. Benjamin Martin (Gibson) is a plantation owner in South Carolina, initially reluctant to join the cause for the sake of staying with his young family. 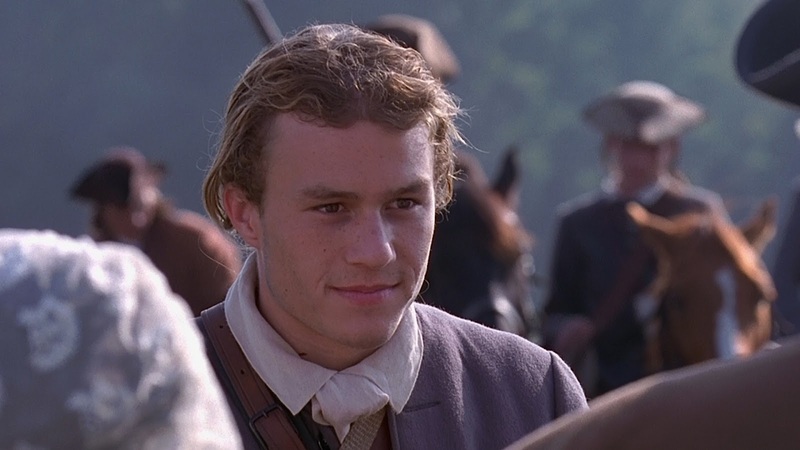 His boys are more eager to fight, and his eldest son Gabriel (Heath Ledger) joins the revolution despite his father's protestations. When Gabriel is injured and younger son Thomas is killed in cold blood by the brutal English Colonel William Tavington (Jason Isaacs) of the Green Dragoons, who burns the Martin household for good measure, Benjamin joins the fight. A seasoned warrior and veteran of the French and Indian War, Martin joins forces with Gabriel and they organize a militia including the French soldier Jean Villeneuve (Tcheky Karyo) and Reverend Oliver (Rene Auberjonois). 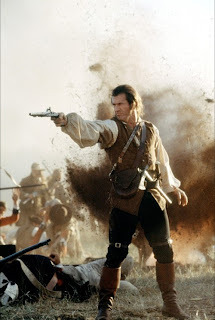 While Martin's friend Colonel Harry Burwell (Chris Cooper) commands the more conventional Continental Army, Martin and his men adopt effective hit-and-run, guerrilla-style ambush tactics against the English, targeting officers and disrupting supply lines. Martin ears the nickname "the Ghost" for striking and disappearing without a trace. As his reputation grows, Tavington and Lord Cornwallis (Tom Wilkinson), the General in charge of the British Army, decide to target the families of Martin's militia members to flush him out of hiding. 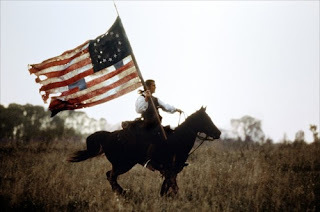 Although several characters are inspired by real historical figures, with Benjamin Martin a composite of American revolutionaries including Francis Marion and Colonel Tavington drawing on Banastre Tarleton, The Patriot does not pretend to be based on true events. The War of Independence featured no fewer atrocities than any other war, but The Patriot does push the limits of credibility with some excessive brutalities by Tavington, including a difficult-to-watch massacre of unarmed civilian accused of assisting the revolutionaries. Mel Gibson delivers his charismatic, reluctant hero persona with smooth ease and the well-practised polish, a man pushed into action, carrying both a violent history and a dangerous skill set. The combination with Ledger is a classic older and wiser man / younger and more attractive guy pairing designed to appeal to a wide demographic, and it works well. Ledger's Gabriel is as idealistic as he is handsome, in many ways a younger Gibson, Gabriel carving his way through the carnage of a brutal war the way Gibson navigated the post-apocalyptic future of the Mad Max movies. Jason Isaac as Colonel Tavington and Tom Wilkinson as Lord Cornwallis are both hungry for the spoils of war, but for the most part represent diametric opposites of the war rules spectrum. Cornwallis is old-fashioned and more likely to demand that battles follow the rules of chivalry. The detestable Tavington makes for quite the villain, Isaac conveying his icy enjoyment of killing and elevating him to an enemy worthy of Benjamin Martin's most virulent wrath. Roland Emmerich directs with an eye on balancing characters with action for the duration of nearly three hours, and he succeeds in alternating scenes of meaningful human interaction with many interludes of intense, gory action. The Patriot allows both Benjamin and Gabriel to discover romance and find love with worthy women (Joely Richardson and Lisa Brenner respectively), and a large cast of supporting characters are allowed the space to make their mark between the deadly musket fire and flying limbs of the battlefields. The Patriot is an old fashioned, grand spectacle of war for a cause. It makes up for some lack of originality with star power and an unflinching presentation of battle carnage. All Ace Black Blog Movie Review are here.